Having trouble downloading SABR e-books? If you're having trouble downloading a SABR e-book like CAN HE PLAY? A Look At Baseball Scouts And Their Profession to your e-reading device, here are some tips. Our e-books, which are available at SABR.org/ebooks, come in three formats: PDF, EPUB and MOBI/Kindle. Please note: The link in the e-mail will expire in 7 days. If you need to have the e-mail re-sent, please contact jpomrenke@sabr.org. Click the link in your e-mail to begin downloading the e-book file. Depending on your browser settings and Internet connection, a blank window may open up while the file downloads. Please be patient; the download may take between 1-5 minutes for large file sizes. On most computers, the file should save directly to your Downloads folder. First, you'll need to download the PDF file to your computer. To view a PDF file on your computer, you can download the free program Adobe Reader by clicking here: http://get.adobe.com/reader. This program allows you to view any PDF file on your computer. Once the file is downloaded, it should have been saved in your Downloads folder. (If you can't find your Downloads folder, click the "Start" menu on your Windows/PC and search for "Downloads." On a Mac, use the "Finder" application then search for "Downloads.") Then click on the file to open it in Adobe Reader. First, you'll need to download the EPUB file to your computer. Once the file is downloaded, it should have been saved in your Downloads folder. (If you can't find your Downloads folder, click the "Start" menu on your Windows/PC and search for "Downloads." On a Mac, use the "Finder" application then search for "Downloads.") Once the e-book is downloaded, you will need to plug your device into the USB input cable on your computer. Locate your e-book folder on your computer. You can do this in the “Start” menu on your Windows/PC or in the “Finder” application if you own a Mac. Drag the EPUB file from the Downloads folder to your device icon on the computer desktop. 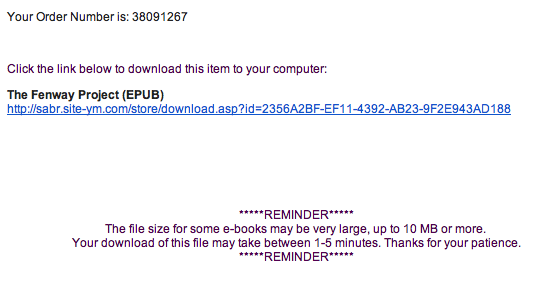 The EPUB file should upload to your e-reading device. If that does not work, send an e-mail to your device's registered e-mail address and attach the EPUB book file in your e-mail. Open the document file on the device and the book should save to the device. For step-by-step instructions on downloading e-books to your Kindle device or Kindle app, click here. 2. E-mail it to your Kindle using the special @Kindle.com e-mail address that comes with your device. 3. Windows/PC users can install a free utility on their computer called "Send to Kindle" that will enable you to right-click any file on your computer and immediately send it to your Kindle device. Download the "Send to Kindle" utility here: https://www.amazon.com/gp/sendtokindle. Then follow the instructions on that page. Other software one can use to download e-books includes iBooks for Apple devices, and a reader called Stanza which reads EPUB files. For those of you who are somewhat techy, there is also a free program for home computers called Calibre which will allow you to convert your e-books from one format to another, add your own custom cover designs and other fun stuff. To go back to the SABR Digital Library page, click here.